Proverbs 17:8 A bribe is like a magic stone in the eyes of the one who gives it; wherever he turns he prospers. Proverbs contains many sayings like this one which need to be thought about carefully. The idea here is not that bribes are being extolled or recommended, but how using such forms of dishonesty end up actually deceiving the one using them. Repeated sinfulness ruins our ability to think rightly. Again in this case – this observation is not to be construed as an endorsement. Bribers think their bribes move mountains – that they are virtual magic. But of course there is no “magic”- no neutral “force” one can access to bring themselves the good or gain they seek so madly. They imagine it makes them to prosper whether they are walking in righteousness or not. It is a lie. One day, they will find out that not only did they not achieve the goal they hoped, but in fact did damage to their own souls, ruining their ability to discern right from wrong. Now those who have not yet understood the Gospel that salvation is all of grace and the free gift of God to those who believe His message of forgiveness and trust the substitutionary atonement Christ made on the cross – in essence believe that their salvation is the product of bribes. They think to bribe God with their good works. To imagine that their guilt can somehow be magically removed by offsetting the balances by going to Church, being a good neighbor, perhaps helping the poor or working for social justice. All things which are laudable and good in and of themselves, but are of absolutely no value in removing the guilt and stain of Adam’s sin imputed to us, nor the sins we’ve actually committed ourselves. And the longer they persist in this mindset, the more deluded they become by it. They constructed this imaginary means of salvation, and thus fool themselves into denying the true Gospel for this Gospel of bribery. But there is a message for Believers here too. Christians cannot interact with God on the basis of bribes either. Yet we do it. We do it sometimes in the aftermath of falling into certain sins, and then make self-constructed deals with God hoping to bribe Him into dealing softly with us. Maybe we ramp up our Bible reading time, or make vows to give more in the offering plate, or attend more services etc. All in essence being attempts to bribe God. And it will not work. In truth, He is far more patient and kind and forgiving than any of us dare to imagine. We could never bribe Him to be any more sweet, for He is already sweeter than we can imagine. When we simply acknowledge our sin and ask for His forgiveness and strength to resist in times to come – trusting fully in Christ’s blood already poured out on our behalf – we know full and free forgiveness in unimaginable proportion. Nor can we bribe God to move His hand in prayer. Some have treated fasting as a form of spiritual bribery to get what we want. Or, as above, we make vows to consecrate our time or efforts in particular ways in order to get Him to answer a prayer request or meet a particular desire we have. But He will not be bribed by any such thing. It is an insult to His Fatherhood. He delights far more in our simple trust than anything we could ever bring to the table in some effort to move Him. We never need to coax blessing from a freely blessing God. That doesn’t mean we do not make our desires and petitions known – but rather that in making them known, we come with hearts fully assured of His love toward us, and His delight in us, and His willingness to bless us above all that we ask or think – because we are already in Christ! 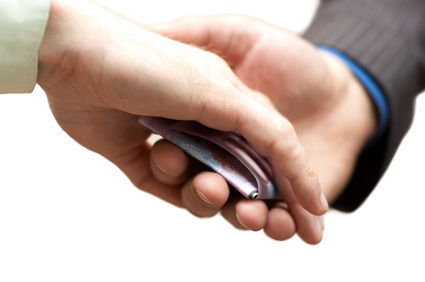 Bribes are evidence that we have not really believed in – and therefore do not really trust – the Gospel. Beloved – He loves you! He cannot love you more, for He already loves you as He loves Christ Himself. Oh how He longs for each of His children to simply live and lavish trustingly in the grace which is already ours in our Lord Jesus. Once we really digest that truth, no form of bribery will ever seem useful or magical to us again.